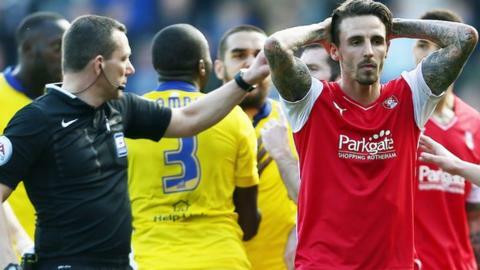 Rotherham United striker Matt Derbyshire has succeeded with his appeal against his sending-off against Leeds United on Saturday. The 29-year-old was dismissed in the second half of his side's 2-1 win for elbowing Gaetano Berardi. The former Blackburn man would have faced a three-match ban had the red card not been rescinded. Derbyshire, who has scored six goals this season, is now eligible to play against Bristol City on Tuesday.